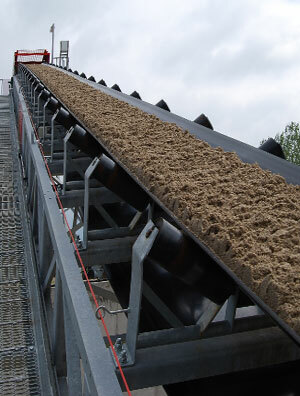 Hoffmeyer supplies a full line of incline conveyor solutions for your business. Floor-to-floor incline belting systems allow you to transport material easily to an elevated area. When you have limited space and need vertical conveying, use our 90° bucket elevator incline belting to move material directly upwards. Hoffmeyer also offers conveyor-to-conveyor belting that connects conveyor systems of different heights, ensuring that your production lines don’t stop moving. Hoffmeyer incline belting options include cleated, rough top, diamond top, and extruded belts that will move your product at the required incline. Our incline belts are flexible, reliable, and durable; they resist wear and stretching damage from abrasion, oil, and heat. Incline conveyor belts also come in a variety of compounds, including nitrile, SBR, and gum. At Hoffmeyer, we are dedicated to friendly and knowledgeable customer service. Our staff is extremely supportive and knowledgeable with more than 90 years of experience in conveyor belting applications. Contact a Hoffmeyer representative today to discuss your needs and we will find the exact incline conveyor belt to meet your specific and unique needs. Hoffmeyer is an industry leader and is dedicated to surpassing your expectations. We provide a full line of incline conveyor belts and incline belting solutions to meet your company’s material handling needs.